Step off the beaten path and head to Kamaole Beach Park II and Kamaole Beach Park III. 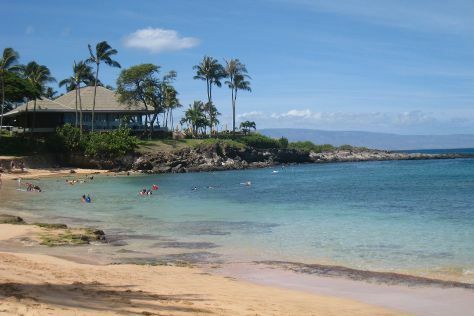 Take a break from the city and head to Kapalua Beach and Wailea Beach. Venture out of the city with trips to Lahaina (Napili Beach & River Rafting & Tubing). There's still lots to do: whizz through the canopy at some of the top local zipline courses and adventure parks, kick back and relax at Wailea Beach Path, stroll through Ulua Beach, and take a tour by water with Boat Tours & Water Sports. To see more things to do, traveler tips, reviews, and more tourist information, read our Kihei travel route planner . Cleveland to Kihei is an approximately 13.5-hour combination of flight and taxi. You can also do a combination of bus, flight, and taxi; or do a combination of train, bus, flight, and taxi. The time zone changes from Eastern Standard Time to Hawaii Standard Time, which is usually a -5 hour difference. Plan for warmer temperatures traveling from Cleveland in March, with highs in Kihei at 82°F and lows at 65°F. Cap off your sightseeing on the 24th (Sun) early enough to travel to Honolulu. Get some cultural insight at Makapuu Lighthouse Trail and National Memorial Cemetery of the Pacific. You'll discover tucked-away gems like Ko Olina Lagoons and Kailua Beach Park. Get out of town with these interesting Honolulu side-trips: Byodo-In Temple (in Kaneohe), Lanikai Beach (in Kailua) and Haleiwa (Sunset Beach Park & Shark Diving). Next up on the itinerary: hike along Koko Crater Railway Trail, see the vivid underwater world at Pele's Chair, enjoy the sand and surf at Ala Moana Beach Park, and admire all the interesting features of Nuuanu Pali Lookout. For reviews, maps, and tourist information, refer to the Honolulu itinerary builder website . Traveling by combination of taxi and flight from Kihei to Honolulu takes 2.5 hours. Alternatively, you can do a combination of car and flight. In March in Honolulu, expect temperatures between 81°F during the day and 68°F at night. Finish your sightseeing early on the 29th (Fri) to allow enough time to travel back home.